It's been more than a year since we last visited the Manila Ocean Park. We were there during its launch and personally, I was impressed by this rather ambitious undertaking. There was only the oceanarium then but looking at the development plan, we set up high hopes and expectations for the project. Malling and sunset-watching. On the positive side, it was good to see that the mall wing is almost complete. We visited on a grey-sky Saturday but espying the viewdecks facing Manila Bay, I knew it would be a great spot to enjoy a mug of coffee while waiting for the sunset, of course, good weather allowing. Oh, and there were quite a lot of food outlets on the ground floor. But it was worth going up to the second level, to the Makansutra Asian Food Village, for a helping of affordably-priced Thai, Indian, Singaporean or Chinese fare. 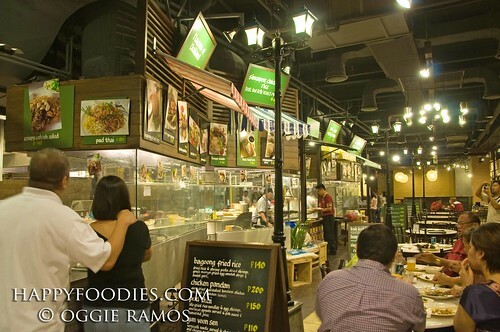 (Read our insights and comments at www.happyfoodies.com). Get the ball rolling. 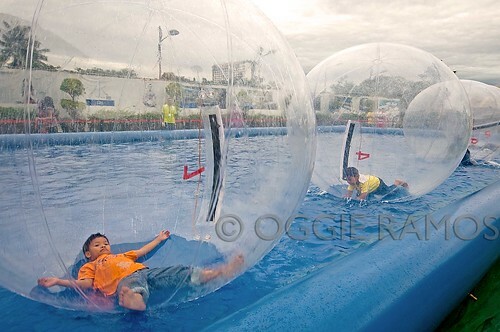 Right before the entrance proper, kids were having boisterous fun enjoying the giant waterballs, inflatable transparent balls suitable for kids (even adults) weighing less than 68 kilograms. At only P40/person, anyone can ride (roll?) along and around the shallow inflatable pool ably manned by MOP staff. Minus points. On the negative side, the long, glass tunnel aquarium is so much less impressive now. Gone are the huge table corals along with the overwhelming number of fishes that made me gape in awe before. There were glass-bottom boat rides within the tank holding the sharks though these cost P150/person. The fish spa, where schools of fishes nibble at one's feet, attract the curious who's willing to pop P120 for this unorthodox and shall we say, fishy, foot treatment. I also find the tiangge-style stalls at the entrance an eye sore. Nothing bad with making commercial use of all those spaces but I thought there must be a better way of presenting those stalls. We lingered well beyond nightfall hoping to see the lighted dome that changes color every few seconds but were disappointed to note that it seems out of commission, hopefully not for good. Saved by the jellies. Spending P400 for a less than satisfying time can be a bummer. 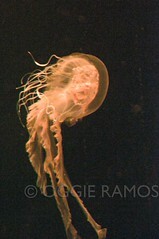 It was a good thing we decided on seeing the other aquatic display -- the "dancing" jellies (P150/person). 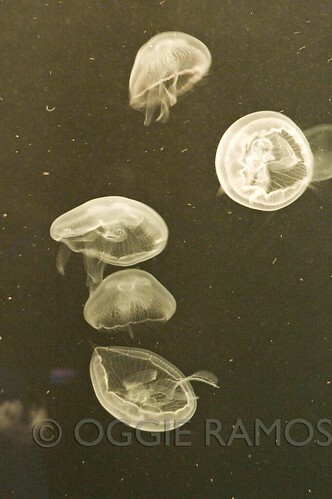 The sight of thousands of jellyfishes seemingly doing this graceful ballet in huge tanks with lighting that constantly changes color every few seconds is one surreal, nay relaxing, experience. As Johnny Depp said in the IMAX feature, "Deep Sea," these animals can look like creatures from deep space instead of the deep sea. If I had more time to spare, I could've easily spent an hour or two just staring at these marvels instead of staring at Nat Geo reruns of Costeau underwater sceneries. Maybe one day soon, I will. was there last tuesday when i accompanied my mom in the us embassy but decided not to get it and just wander in luneta instead. someday papasukin ko din yan. ang ganda ng gallery sa sidebar. ang linis. Thanks bai. It's worth naman looking into the display lalo na't its your first time to see them. Was just disappointed kasi there's nothing really new after a year. 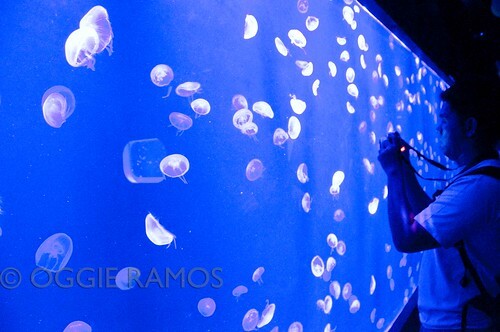 Buti pa yung Jellyfish display. Cleaned up na the sidebar. Yung mga links niyo nasa bookmarks ko naman sa computer kaya cleaned that up na rin as well. I'm still deferring my visit until major improvements are done. 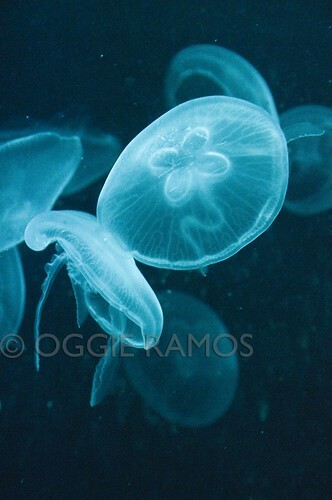 I liked HKG Ocean Park a lot especially the sea jellies. Kaya, I'm worried that I'd expect much when viewing the one in Manila. But I'd like to try the fish spa there. Thanks WitsandNuts. I guess it's natural to expect much and compare the one here with the one in Ocean Park. Chyng, hope you get to visit nga one of these days. It's worth seeing naman. wow! kailangan namin bumalik dito. a lot of new stuffs to try! and this time for Mico. I was hoping for some improvements when it opened but it's just a marginal and probably even turned out worst. Ferdz, sayang nga eh, they could make something great out of this. Baka me funding problems which explains the stalls and kiosks. Hi Ogg, I noticed you got the wrong figures when you converted the peso fare to dollars. "Entrance fee to the oceanarium: P400 (roughly US$85 for adults) and P350 (around US75 for kids)"
P400 is less than $10 and so is P350. I know this was just a typo and I hope you don't mind me pointing it. Hi Lad, uy thanks for pointing that out. Have corrected the figures na. Thanks!